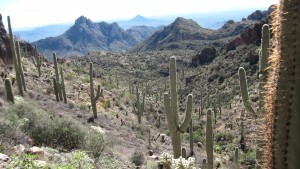 AZT Passages 16-17, In 2008, we hiked through these passages. At that time the trail was marked intermittently with many ribbons and cairns going in different directions. Some were surely put there as a potential trail to follow but as we tried we encountered miles of bush whacking through mesquite trees, thorny bushes and cat claw and found ourselves further away from our waypoint. We did find our way but with much distress. But not this time! Thank you Arizona Trail Association and all the volunteers! 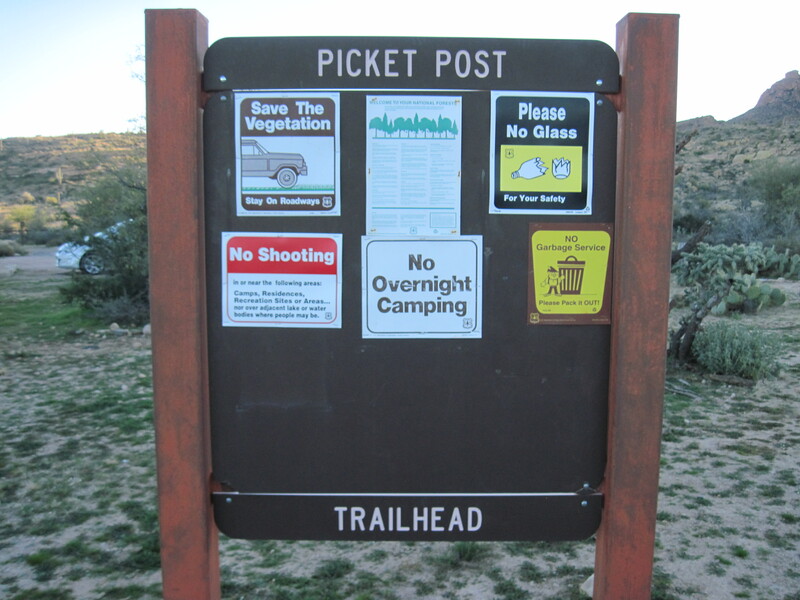 January 16-19, 2015, Starting at Picket Post Trailhead, we knew we would have more water holes than in 2008 as the area was covered with snow and rain just 10 days before. Pass 16 was greener with many damp spots but nowhere a sign of a puddle. FR4, Trough Springs and the metal tank was totally dry and no sign of water in the creek, but then a miracle, Judy found a small pot hole by the road. Our spirits were lifted with the discovery. Another few days and this would have been gone too. Several Jeeps and quads went by so I think we may have been able to bum some water had we not found the pothole. Not sure they would have given us 9 liters. We were each able to get 3 liters to carry for the next 11 miles. Arriving at the dirt tank we found we had to share the water with the local live stock. It certainly needed filtering, boiling, and Clorox for good measure but always thankful whenever and wherever we find water. Day 2: 1 mile from camp was Ajax Rd. 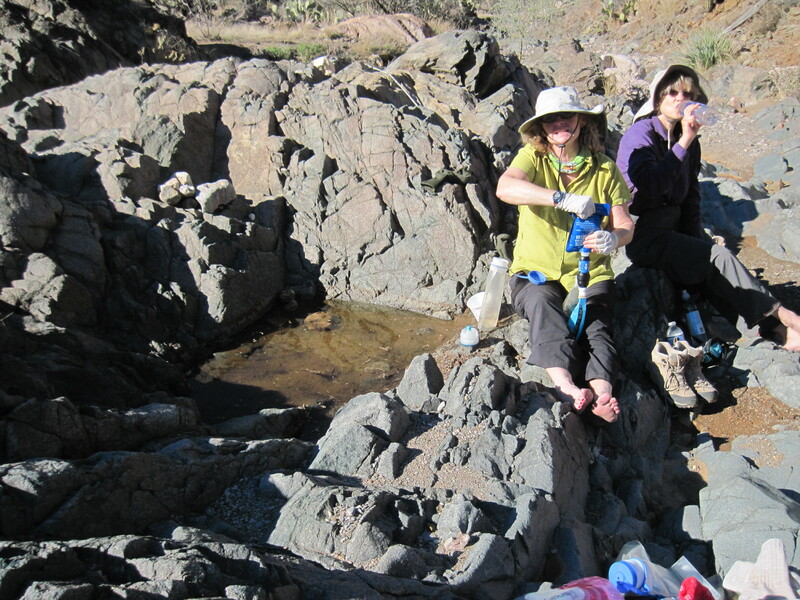 There was 1 1/2 gallons of water left by a trail angel but we already had 3 liters each so we left it for the next hiker in need. The new trail must have been a feat to construct. It was beautifully done. The new AZT book described it as “dramatic geology and one of the best sceneries compared to the Grand Canyon.” We agree! For several miles we were blessed with the shade of the mountain making the experience even more delightful! We were still hopeful to find water in the catchments but it was as dry as Pass 16. 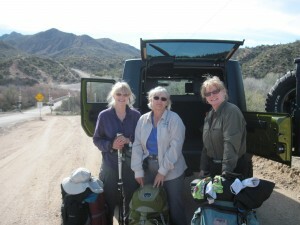 Eleven miles later we arrived at the Gila River near Cochran. This area may be quiet during the week but arriving on a 3 day weekend was anything but quiet. There were SUV’s, quads, kids, people using axes and chain saws (after dark) and at midnight a couple of people were target shooting with a 6 shooter and rifle for an hour and 15 minutes. With no moon we could only guess what they were shooting at. None of us slept very good this night. Day 3: We started out early today to avoid the heat of the day. It was in the low 70’s but still seemed very warm carrying the extra water weight. Putting deodorant on our feet helped with the sweating perhaps avoided more hot spots. We were told there was no water going forward even though we bordered the Gila River for 15 miles. 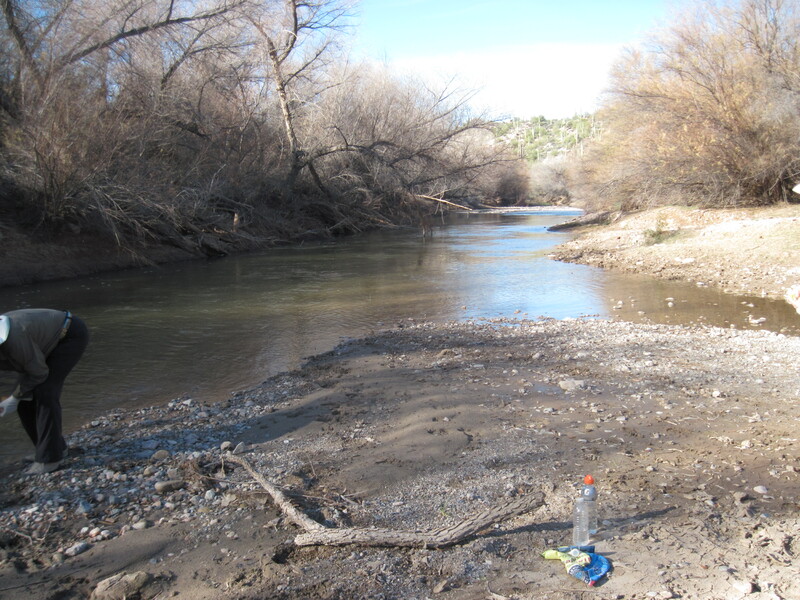 However, we did find 3 places to access the Gila through Tamarac forests (salt cedar)so next time we won’t carry so much water. 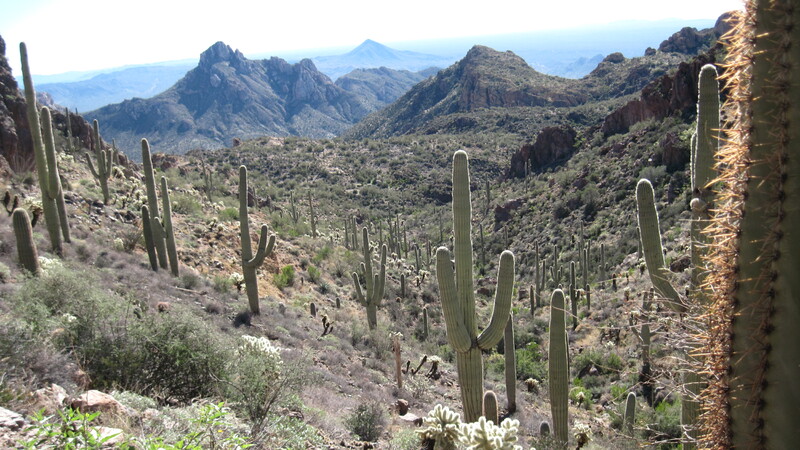 Other times we were high on the ridges overlooking the Gila and railroad track. We passed several mines and examined artifacts of mining equipment. Around 3pm and 10 miles later we found a beautiful spot we would call home for the night in a large wash near the Gila. 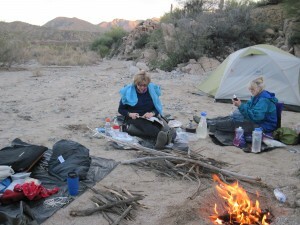 Tomorrow we would be ending our trek at Kelvin Bridge so it was unanimous to relax and talk about our adventure around a nice fire. We devoured anything we had left except for breakfast food. The stars were amazing. We could see forever into the universe! Thank you God! You always give us more than we expect. Day 4: This morning it was 6 ½ miles to Kelvin Bridge where we would be picked up and taken back to Picket Post TH for our car. 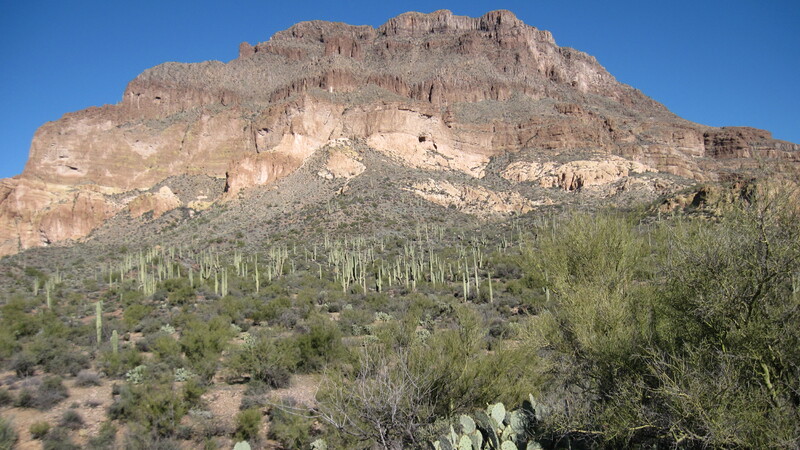 The original trail followed the railroad track but the new trek goes up the ridge, following the mountains coming close to Ray mine. We agree these passages are amazing but be prepared to carry extra water.